Please click the name of the Program below for more details! My most popular program. 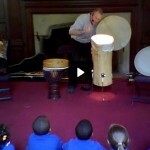 Drums, Songs & Stories Celebrating Cultural Collaboration and Global Awareness. This program can also support peace and tolerance themes. Drums, Songs & Stories about pretty much anything. General Theme. Award winning songwriter and storyteller and Peak Performance Coach, Mark Shepard uses Drums, Songs and Stories to celebrate the power we all have as individuals to make a positive difference in the world. Drums, Songs & Stories from Africa & the African Diaspora. 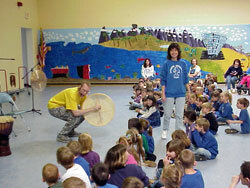 Drums, Songs & Stories Celebrating Northern Lands and Cultures from the Inuit (Eskimos) to Ireland and Scandinavia. The Bully Proof Kid – an Anti Bullying School Assembly Program that does more than just preach at kids. 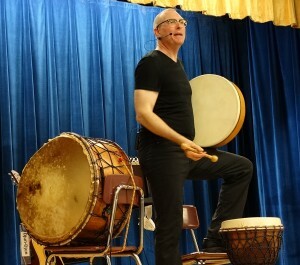 Mark Shepard uses his Drums, Songs and Stories along with his 10 years of experience as a Master Practitioner and Trainer of Neuro Linguistic Programming (NLP) to entertain and educate while delivering powerful “take away” tools to assist students to defuse potentially dangerous confrontations with bullies while keeping their self esteem and self respect intact.